Q. 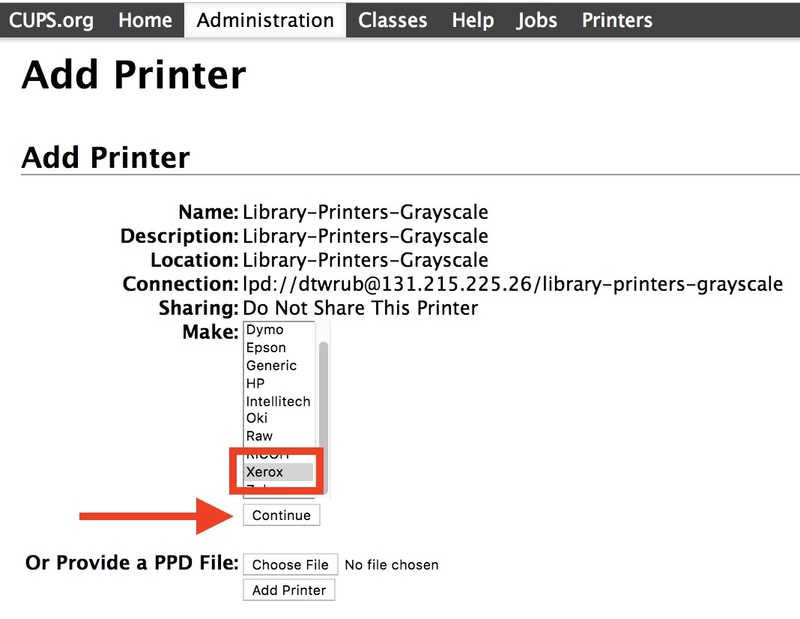 How can I print to the Library Xerox machines from my Mac laptop? These instructions are current as of 11/6/18. Please note that printer driver files and configurations may change. If there are any inaccuracies in these instructions, please let us know at library@caltech.edu. Go to https://www.support.xerox.com/support/altalink-c8000-series/downloads/enus.html​. Under Associated Product select Built-in Controller. Select your Operating System and Language. 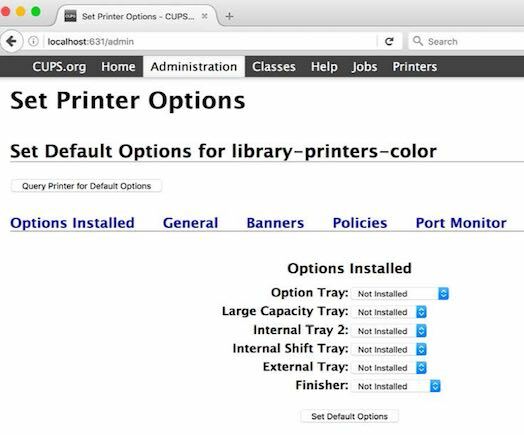 Download the "macOS Common Print Driver Installer". Once downloaded, run the installer. For the Select Printer step, click Continue. If the message Print Queue Not Created appears, click Continue again. The software should then be successfully installed. Launch a web browser and in the URL bar enter the following: localhost:631 for the address. The web interface is currently disabled. 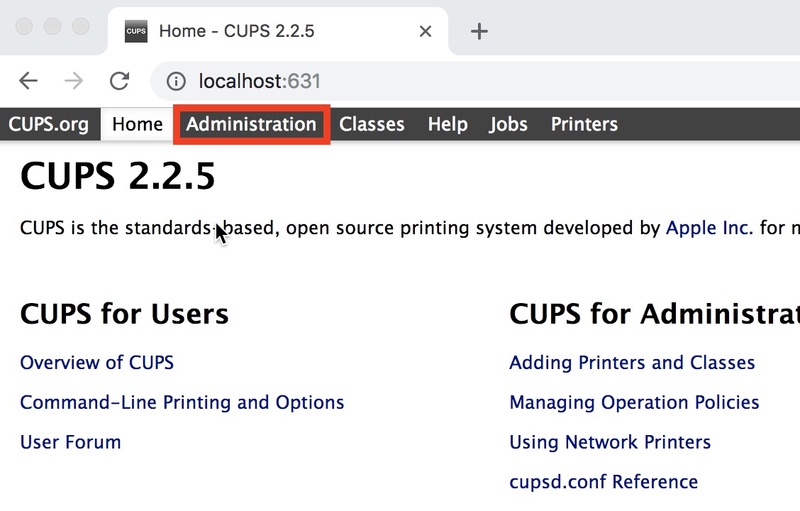 Run “cupsctl WebInterface=yes” to enable it. If this happens, proceed with this step. If you do not see this message, proceed to step 6. When complete you can exit Terminal. Refresh your browser screen with with the URL set to localhost:631 and proceed to step 5. You should now see the following screen. Click the Administration link near the top. On the following screen, click the Add Printer button. credentials. (Note: this is NOT your access.caltech account. This is your local machine admin login account because you are making changes to your local machine). Enter your local machine admin authority credentials and click the OK button. 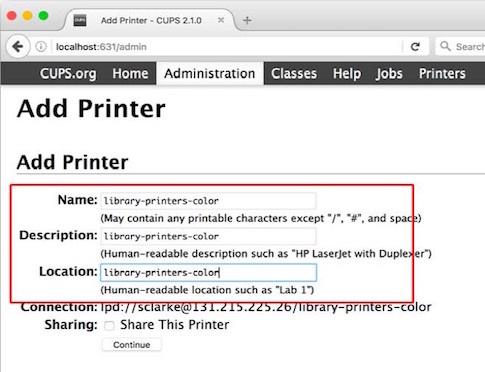 On the following screen select the LPD/LPR Host or Printer bullet and click the continue button. 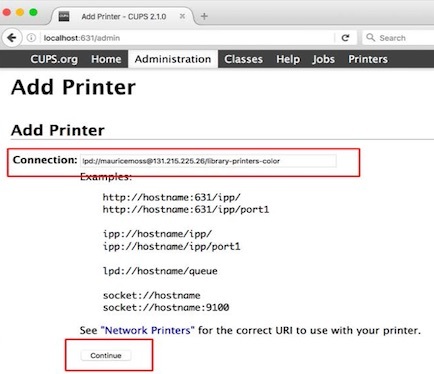 ​to add the grayscale printer queue, ​and replace <access.caltech.username> with your username, without the angle brackets. The access.caltech username must be correct otherwise card release will not recognize the print job. After entering the appropriate information, click the Continue button. Enter descriptive data here (it can be whatever you want), then click the Continue button. On the following screen, under the Make pulldown window, select XEROX and click the Continue button. If you do NOT see Xerox listed, try reinstalling the driver. On the following screen, scroll down until you locate the appropriate Printer model/driver. Select Xerox AltaLink C8055 and then click Add Printer. If you reach this following final page, then your printer has successfully been added. Repeat steps 6-13 to add another printer if needed (color, grayscale). 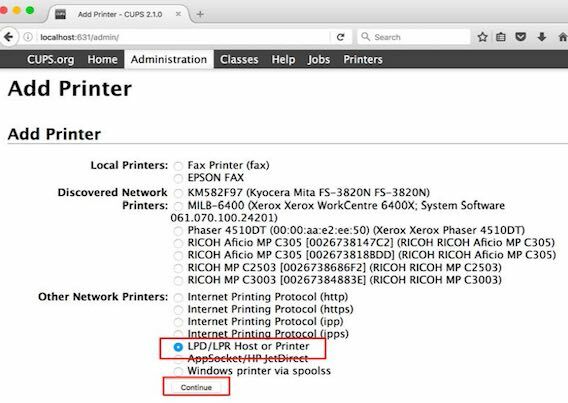 At this point, the printers should be available from any application on your Mac from which you can normally print. When you send your print job to the print queue, you can print from any Library printer. They are located in Sherman Fairchild Library (4 machines), Millikan 9th floor, Dabney 1st floor, Cahill, and Geology main room. From any printer, swipe your card, enter your access.caltech credentials, or enter your PaperCut pin number, and you will see a list of all pending print jobs. You can then choose to either print or cancel the job. 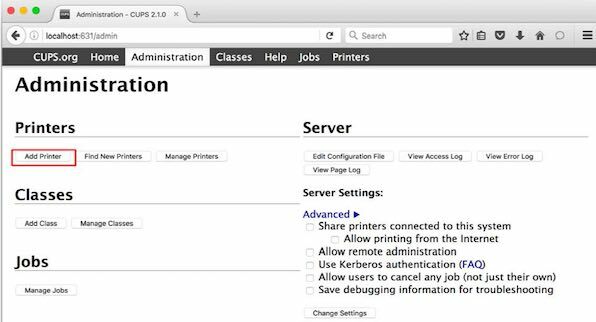 Don’t forget to log out when finished using the printer – you will be logged out automatically after about 60 seconds with no activity.